Did the lack of an election threshold save The Netherlands? The Netherlands. Also known as flat Switzerland and as the inventors of the stock market crash. A country you think of so little that we were surprised by the international attention for the Dutch election last week. Although The Netherlands is the 17th economy in the world we are used to being ignored,* typically not making any trouble. But this time the three part question was whether after Brexit and Trump also The Netherlands, France and Germany would destroy their societies in response to radical fundamentalist grandpas campaigning against radical fundamentalist Muslims. The answer for the Dutch part is: no. To be honest, this was clear before the election. The Netherlands has a representative democracy. The government is elected by the parliament. The seats in parliament depend closely on the percentage of votes a party gets. This is a very stable system and even when Trump was inaugurated, the anti-Muslim party PVV polled at 20%, no way near enough to govern. The PVV survey results plotted below are in seats, 20% is 30 seats. Every line is one poling organization. Due to the Syrian refugee crisis the PVV jumped up in September 2015. They went down during the primaries as the Dutch people got to know Trump and the refugees turned out to be humans in need of our help. After getting elected, Trump favorability went up; Americans gave Trump the benefit of the doubt. The same happened to the PVV; if America elects Trump, he cannot be that bad? Right? Right? While Trump was trampling America as president and filled his cabinet with shady corrupt characters, the PVV dropped from 20% to 13% (20 seats). There is no guarantee the drop of the PVV was due to Trump, but the temporal pattern fits and the leader of the PVV, Geert Wilders, is a declared fan of Trump. People campaigning against the PVV made sure to tie Wilders to Trump. For example in this AVAAZ advertisement below. I hope AVAAZ will also make such videos for France and Germany. I would certainly not have minded the election being a few months later to give Trump the possibility to demonstrate his governing skills more clearly. This will also help France and Germany. In addition Germans know their history very well and know that German fascism ended with holocaust it did not start with it. It started with hatred and discrimination. The most dangerous case is France with its winner-takes-all presidential system. I expect that it also hurted the PVV that Wilders did not show up for most of the debates. Without the solution-free animosity of Wilder it was possible to have an adult debate about solutions to the problems in The Netherlands. Refreshing and interesting. The last days he did show up, the level immediately dropped, making clear what the main Dutch political problem is. Wilders. As the graph below shows the Dutch parliament will have 13 parties. This has triggered a debate whether we need an election threshold. A poll made around the election shows that a majority of 68% would be in favor of an election threshold of at least 2 seats (1.3%) and 28% even favor a threshold of 5 seats (3.3%). As the map below shows such a threshold would fortunately still be on the low side internationally. Each chamber has a different threshold. I think a threshold, even a low one, is a bad idea. The short-term gains are small, the short-term problems are big and we risk a long-term decline of the Dutch political culture, which is already at a low due to Wilders. The arguments are not specific for The Netherlands. I hope these thresholds go down everywhere they exist. The main argument in favor is that small parties make it harder to form a coalition government. This is true, small parties need visible influence to make governing worthwhile and survive the next election, which means they get an over-proportional piece of the pie. This makes other coalition partners worse of, which makes negotiations harder. However, next to the small parties, which are hard to include in a government, we also have the PVV, which is hard to include because of their ideology and lack of workable ideas. The small parties in this election (PvdD, 50+, SGP, DENK, FvD) have 17 seats combined, while PVV has 20 seats. Getting rid of the small parties would thus reduce the problem by less than half. Not having large toxic parties in parliament would be at least as important. Also without small parties we now need four parties to build a government. The election threshold would need to be very high to reduce that to three parties. So the benefits are small. If the threshold were that high, an immediate problems would be that people voting for small parties are not represented in parliament and also less in the media. This is unfair. This can have severe consequences. In Turkey the election threshold is 10% and in 2002 they had a case where 7 sitting parties were below this threshold and a whooping 46% of all votes were without representation in the parliament. That is a big price to pay for making it somewhat easier to build a government. An election threshold also stimulates strategic voting, where people do not vote the party they agree with, but a party that will get into parliament or government. In the last Dutch election election a quarter of the voters voted strategically. The right wing VVD and the social democrat PvdA were competing for the number one spot. In the end they made a coalition government, which was thus not supported by the population, was highly unpopular and lost heavily this election. That is not a dynamic you want to enforce. Strategic voting can also mean that a new party that does have sufficient support to pass the threshold does not get votes because many do not trust they will make it and many keep on voting for an existing party they like less. Last week's Dutch election had a turnout of 80%. Having more parties means that people can find a better match to their ideas. A faithful ideologue may just need two parties, his own and the one of the enemy. If you just think of the left-right axis, you may be tempted to think you only need two or maybe four parties to cover all ideas. Whatever "left" and "right" means. It feels real, but has those funny names because it is so hard to define. Political scientists often add a second axis: conservative to progressive. 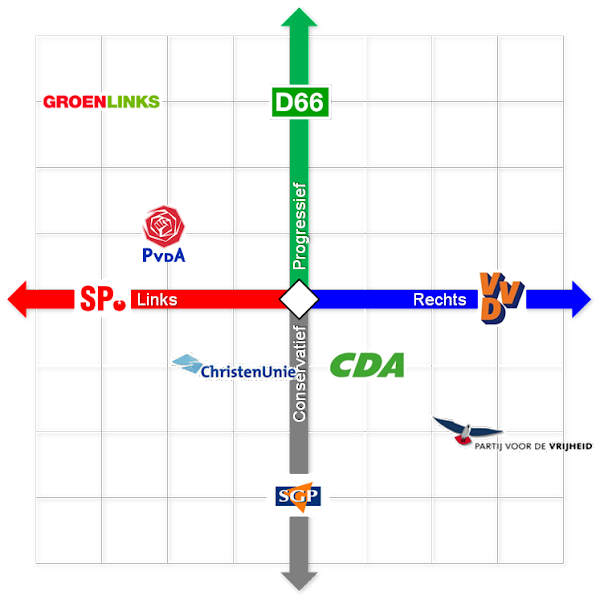 The graph below puts the Dutch parties on both axis. Left to right on the horizontal axis and progressive at the top and conservative at the bottom. The parties that care most about the environment and poor people (GroenLinks, SP, Christen Unie, D66) are still all over the map. The vertical axis also shows how materialistic the parties are, with parties that care about the distribution of money and power in the middle and parties that find immaterial values important at the top and the bottom. In other words: we need multiple parties to span the range of political thought and have parties that fit well enough to get out and vote. Having a choice also means that it pays to pay attention to what happens in politics. American pundits like to complain that Americans are badly informed about politics and the world, but why would the voter pay attention? The US set up an electoral system where the voter has nearly no choice. The US has two parties that are way-out-there for most people. Because of the districts a vote nearly never matters, especially after [[Gerrymandering]]. There are just a few swing districts and swing states where a vote matters. That is really bad for democracy. Changing the system is more helpful than blaming the voters. VVD used to be a pro-business individual liberty party, but has become more conservative and brown. CDA a center-right Christian democratic party. Christen Unie is an actually Christian party that tries to follow the teachings of Christ and cares about the environment and the (global) poor. SGP is a quite fundamentalist Christian party that likes the Old Testament more. PVV is the anti-Muslim authoritarian party. For the Americans: Most of the policies of Bernie Sanders are Christian democratic (although they would use different words to justify them). That politics is much more than one axis can also be seen in a transition matrix. The one below shows how voters (or non-voters) in 2003 voted in 2006. A reading example is that people who voted CDA in 2003, voted CDA in 2006 in 71% of the cases and voted PvdA in 3% of the cases. There are many transition that do not follow the left-right axis or the conservative-progressive axis. People are complicated and have a range of interests. The main problem is on the long-term. An election threshold limits competition between parties. A threshold makes it harder to split up a party or to start a new one. That is nice for the people in power, but not good for the democracy within the party and for the voters. Parties become more vehicles of power and less places to discus problems and ideas. With a high threshold the party establishment can kick people or small groups out without having to fear much consequences. A wing of a party can take over power; neutralize others with near impunity. When a party does not function well, becomes corrupt, starts to hold strange positions or sticks to outdated ideas, voters cannot easily go to an alternative. 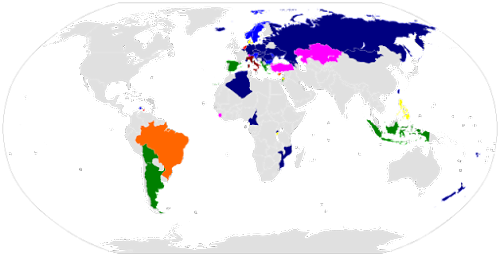 In the map with thresholds above you can see that high thresholds are typical for unpleasant not too democratic countries. You see it in the USA where the corporate Democrats thought they could completely ignore the progressives because they would be forced to vote for them lacking a real alternative and in the face of grave danger to the Republic. Politics in Germany is much more about power (with a 5% threshold) than in The Netherlands, where politicians make compromises and try to get many people on board. There is no way to prove this but I think the election threshold is important for this. That is why countries with low thresholds have parties with new ideas such as environmentalism or the hatred of Muslims or old fashioned niche ideas like general racism. In the latter cases you may like that these ideas are not represented in parliament, but the danger is that it suddenly blows up and Trump becomes president. Then it is much better to have Wilders in parliament making a fool of himself, making public that many of his politicians have lurid and criminal pasts, and demonstrating that he cannot convert his hatred into working policies and legislation. It also gives the decent parties the possibility to respond in time to the real problems the voters of such parties have, which they project on minorities. The lack of competition also promotes corruption. It makes corruption less dangerous. In the extreme American case of two parties a lobbyist only has to convince party D that he can also bribe party R and both party can vote for a bill that transfers power to corporations on a Friday evening without any possibility of voters to intervene. In the extreme case the corruption becomes legalized and the politicians mostly respond to the wishes of the donor class and ignore everyday citizens. The disillusionment with democracy this creates makes it possible for anti-democratic politicians like Trump or Wilders to go beyond their small racist niche. So my clear advice is: Netherlands, do not introduce an election threshold. America, get rid of your district system or at least introduce more competition with a [[ranked voting system]]. In Dutch: Which effects would an election threshold have had on the 2012 election? Welke effecten zou een kiesdrempel hebben? In Dutch: How good were the polls? Hoe dicht zaten de peilingen bij de uitslag? * Also Angela Merkel has visited The Netherlands only 6 times in her 12 years of rule. A short post with a question of counterfactual history. The Celsius temperature scale developed by Anders Celsius (1701–1744) himself had 0 °C at the boiling point of water and freezing was 100 °C. It had the advantage that negative numbers would not occur in normal use. Daniel Gabriel Fahrenheit (1686–1736) achieved this for his temperature scale by choosing the lowest temperature in his village or a brine mixture as zero. Negative numbers may well have been controversial at the time. Only in the 17th century the idea of negative numbers was accepted by western mathematicians. The forward scale we are used to was independently developed by several of Celsius' contemporaries. What would have happened if we had kept to original Celsius scale? 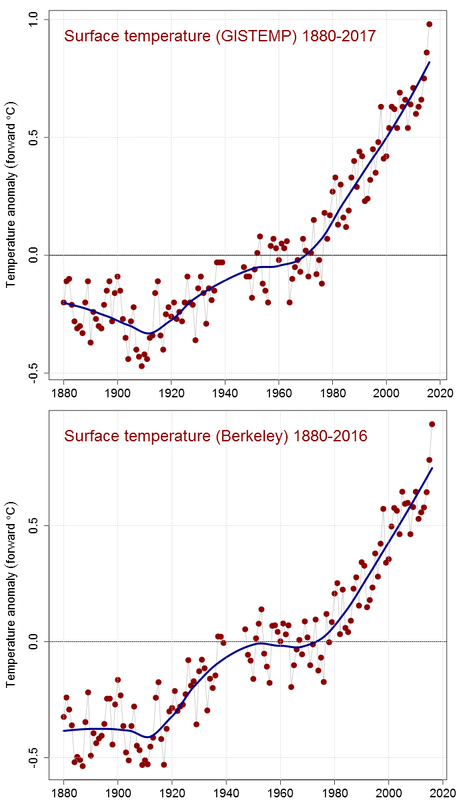 In forward degrees Celsius global warming produces an upward curve. In our current culture that is associated with progress and growth. 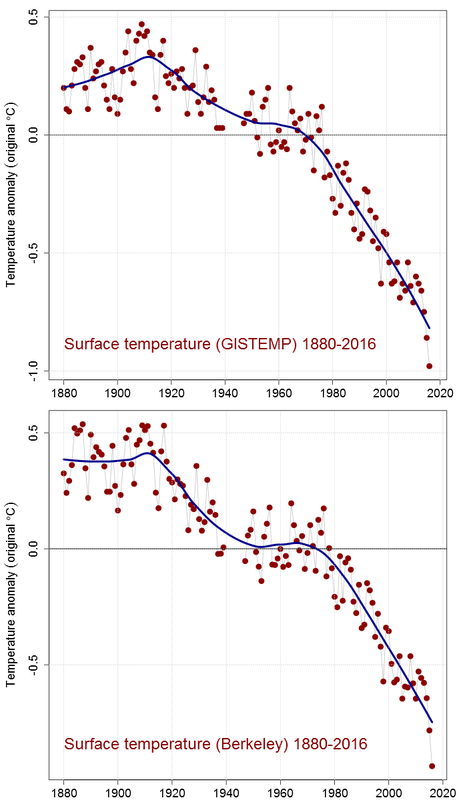 In the original Celsius scale the same plots would look more depressing like this. If the temperature graphs had looked like the graphs of Arctic sea ice would that have changed the course of history? Would we have taken the problem seriously in the 1990s?